High up in the Andes, in Moray, Peru, ancient stone rings descend into a hollow in the mountains. The Incas built these curious structures, called muyus, hundreds of years ago as a standalone site in a remote area, far away from any a larger stone city or temple. What was the purpose of this bizarre and monumental structure? Was Moray a site for ceremonies? Political events? A landing pad for extraterrestrial visitors? The site at Moray became known to western archaeologists in 1931. 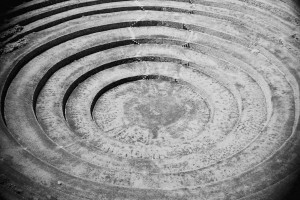 The striking concentric rings were spotted from above by the American geologist Robert Shippee during an aerial survey of the Sacred Valley, a rich agricultural area near Cusco. Local Quechua people, the descendants of the Inca, and local Spanish-speaking Catholic priests alike knew about the muyus at Moray and thought them to be an Inca ceremonial site. These local accounts were considered dubious by the (perhaps somewhat arrogant) American archaeologists and geologists, as the site had not been used for four centuries. So archaeologists began using physical evidence from the site to puzzle out what purpose the muyus had served. In the 1970’s an Australian physicist named John Earls recorded a drastic temperature stratification in the rings, ranging as much as 15°C between the hottest and coldest ring. He speculated that the site might be an open-air agricultural research station, as the ring structures acted to create a variety of microclimates, each distinct in hydrology and temperature. In recent years, some doubt has been cast on the story that the Moray site was an agricultural experiment. A pair of American hydrologists, Kenneth and Ruth Wright, figure that details about drainage and the soil at Moray make it unlikely that the site was built to be irrigated as farmland. They suggest that it may instead have been a ceremonial site after all, as the local people originally held. 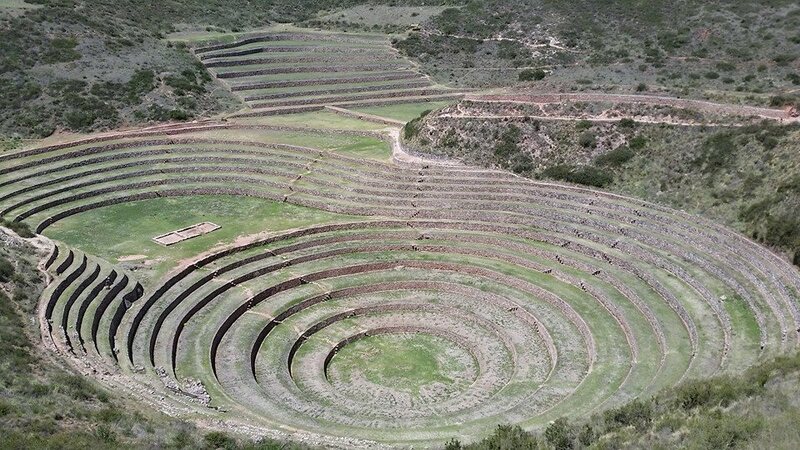 While archaeologists are still duking it out based on scant evidence, the dominant theory about Moray, the theory still on the signs at the site, was that this was an Incan agricultural laboratory, conducted on an imperial scale. The idea behind this laboratory theory is that these microclimates could be used to acclimatize and breed crops being moved from one part of the empire to another. This would constitute a more centralized, imperial approach to the crop experimentation that goes on all around the Andes, with farmers setting up several small fields called chacras at different elevations to try out and breed different crops. Crop breeding and experimentation in the Andes has yielded a huge number of pepper, squash, potato and corn varieties over the centuries. These varieties are a very important source of genetic diversity that may be useful in producing new varieties in the event of a crop disease epidemic or global climate change. In addition to this, they are delicious and colorful and wonderful and we are all richer for having them. Incan emperors ruled over a vast territory encompassing many different climates, from the Pacific Ocean, across the Andes, and into the cloud forests that eventually give way to the Amazon rainforest. In the process of building this empire, the Inca conquered many older civilizations, each of which had their own domesticated crops and agricultural practices. 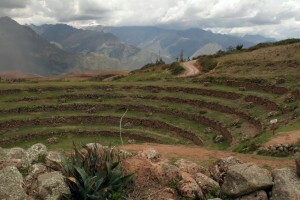 The Inca moved these crops around the empire to improve the dietary variety and agricultural yield available to local peoples. Getting a potato domesticated at an altitude of 4,000 ft to grow up at 9,000 ft requires some adjustment, however. There are two major tools available to farmers: acclimatization and breeding. Breeding selects for genetic variants that help a plant thrive in the new environment – out of 100 seeds, some will carry genetic variants that make them better suited to deal with the new conditions. Repeatedly choosing the most vigorous individuals for multiple generations will produce drastically different crops that can grow well in the new environment, in the same way that breeding a dog for size for generations can get you a Great Dane or a Chihuahua. Acclimatization works on an epigenetic level, rather than a genetic one. The changes occur in the course of the life of one plant, and involves a change not in genes, but in the way those genes are regulated. When crops are grown from seed at a different temperature, soil type or moisture level, the plants have a chance to acclimate to the new habitat over the course of their lives. This is a similar process to how fair skinned people get tans in response to intense sunlight; it is not a change in genetics, but in how those genes are deployed as a response to the environment. The pre-Columbian Andes were a major center for crop domestication, bringing the world sweet potatoes, common beans, squash, potatoes, tobacco, quinoa and many other useful crops. The Inca faced the huge challenge of transporting and growing these crops in the very different provincial climates of their empire. The muyus at Moray may represent an ingenious, imperial scheme to acclimatize and select crops to grow across the empire. With its gradient of temperature, sunlight, and moisture all packed into a tight area, Moray would have provided a neat test field for either breeding or acclimatization, or both. Alternatively, it’s possible that Moray was a ceremonial and not an experimental site. In this scenario, local farmers bred and acclimatized the thousands of potato varieties, along with countless squash, pepper and corn cultivars, in their small Andean chacras. I honestly don’t know which would be more impressive. Whether it was small-time farmers working little patches of land or imperial Incan agronomists operating from their ancient UFO landing pad, next time you reach for the potato chips, give a thought to the Inca ingenuity that brought them to you.